Alliance Advantage Bands are a great choice for go-to everyday rubber bands for a variety of applications. With a mid-range rubber content and a sturdy, firm stretch these elastics provide users with both value and durability. With a soft stretch and an ultimate elongation at 700%, Advantage elastic bands are ideal for many different environments and tasks. Rubber bands are a useful and handy tool to keep around the house. They're great for organizing and storing kid's crafts and games, and are perfect for food storage and transport. Elastics can be used to give a broom new life by wrapping the bristles tight, or to secure a loose battery cover on a remote control. Advantage elastic bands are also great for core office tasks as well as industrial and warehouse environments. They provide an excellent hold and firm stretch so they can be used for more demanding tasks and projects. Rubber bands can be used for bundling and filing paperwork and folders or for keeping tools and equipment organized. 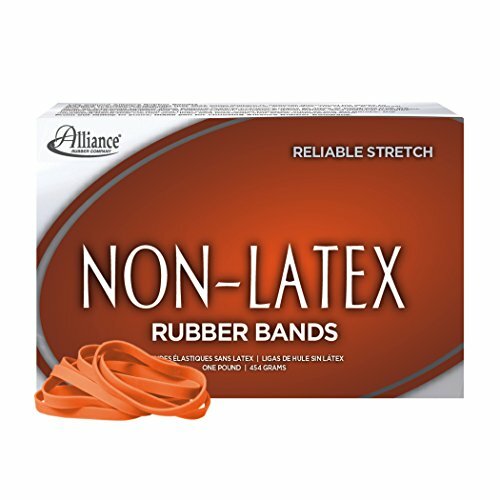 Promote a healthy latex-free environment at work or at home with Alliance Non-Latex Rubber Bands. Ideal for use by or around those with latex sensitivities, these rubber bands are made from a synthetic rubber compound that helps to prevent triggering latex allergy reactions. The bright orange color of these non-latex bands makes them easy to distinguish from regular bands. The soft stretch of the elastics is easy on your wrists to prevent the symptoms of carpal tunnel syndrome when doing repetitive actions, particularly in an office environment. The high rubber content makes these rubber bands strong and durable so that they can be re-used many times. Use these elastic bands wherever you would use normal rubber bands, such as for organization in offices, schools or at home. Safely bundle utensils in medical facilities or cover up equipment not in use by securing covers with these non-latex bands. They're also great for packed lunches and to keep produce and food secured. These rubber bands can be sterilized using an autoclave and irradiation so that they're safe and clean to use in medical facilities. Assorted sizes, colors, and thickness. 8oz (227g) - approx. 400 bands. Made in the use great for a wide variety of jobs in home, office or school. 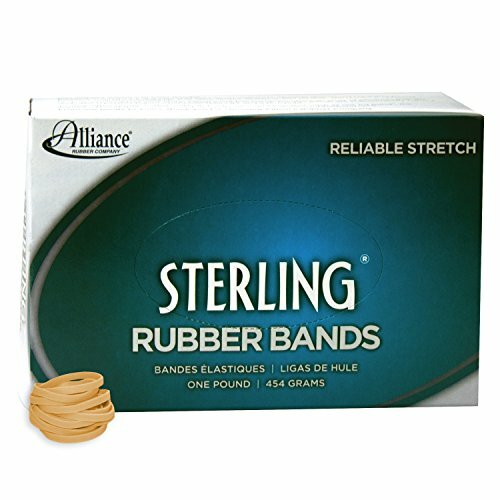 Alliance Sterling Bands are our best value rubber band. These bands feature a high rubber content, which means they are lighter, stretchier and more durable. You receive more bands per pound and can drop back a size for even more cost savings. With a soft stretch and an ultimate elongation at 750%, Sterling elastic bands are ideal for many different environments and tasks. Rubber bands are a useful and handy tool to keep around the house. They're ideal for staying organizing in the kitchen, home office and garage and are great for storing kid's crafts and toys, or for food storage and transport. Elastics can be used to give a broom new life by wrapping the bristles tight, or to secure a loose battery cover on a remote control. Sterling elastic bands are great for core office tasks as well as industrial and warehouse environments. Their soft stretch is ideal for repetitive use tasks as they put less stress on the hands and wrists, which helps to avoid repetitive strain injuries. 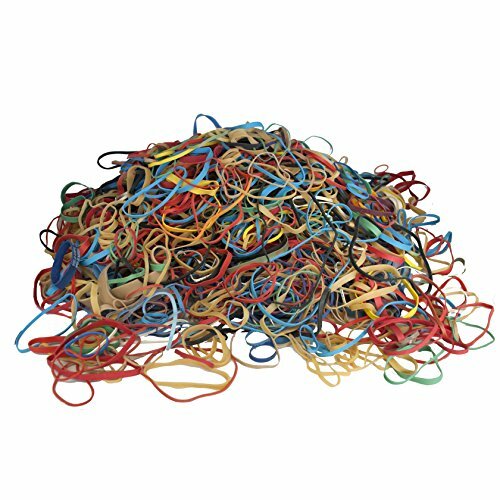 Rubber bands are great for filing and bundling paperwork, or for keeping your warehouse organized and safe. Alliance Rubber Brites File Bands are durable, reusable, multipurpose colored elastics designed to make your life easier and allow you to work quicker. Made of non-latex rubber, they are great for use in schools, offices, and homes that are latex-free. These bands come in a variety of bright shades and sizes in a convenient dispenser for quick and simple file organization. They are easy to stretch and spring back to create a secure and tight fit over a variety of items around the home or office. 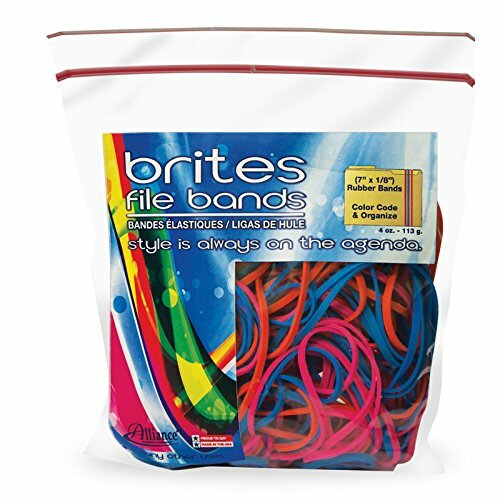 Brites File Bands can help you organize your office, kitchen, garage, classroom, and craft room. These colored rubber bands are freezer and microwave safe, making them great for creating a tight seal on food storage in the fridge or freezer, and keeping your microwave clean by securing covers or lids when cooking or re-heating. Colored elastic bands are also a great tool for the DIY-er. Whether you're creating a photo collage, amazing rubber band jewelry, tie-dye clothing with the family, or upgrading old vases and glassware with elastics and spray paint, the options are endless. Alliance Rubber's Big Bands are large elastic bands for oversized jobs. These heavy duty rubber bands are a great tool to keep around the home, office or school to help you organize, bundle and store a wide range of products, items, and boxes. They are reusable and stretch easily for a variety of uses. Ideal for keeping trash liners in place, these garbage bag bands fit cans from 13 qt. to 32 gal., so they're great for both home and commercial use. Keep these large rubber bands in your kitchen and you'll never run out of uses for them. Freezer and microwave safe, they're great for securing food lids for storage or for keeping food fresh. 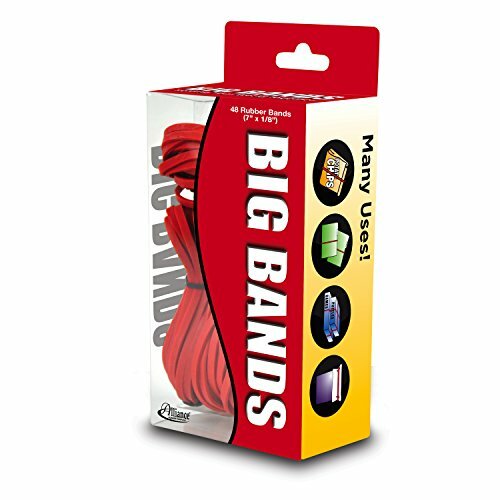 Use these oversized rubber bands in the workplace to bundle paperwork, keep files together or as a shipping tool. Use them around the house to keep board games together, bundle cables and cords, or even to bundle holiday decor and camping equipment. 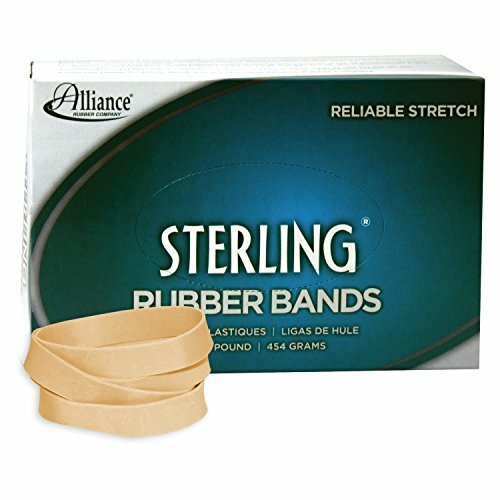 Brand: Alliance Rubber Company Inc.
Packaging, shipping and storage is made easy with Alliance Rubber SuperSize Bands. 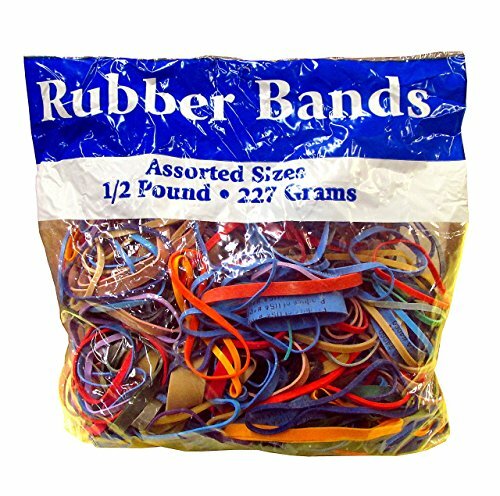 These large rubber bands are industrial-strength and excellent for keeping big items secure and bundled. Use these large elastic bands to keep box flaps open while packing or picking. Then use the bands to keep boxes tightly closed. 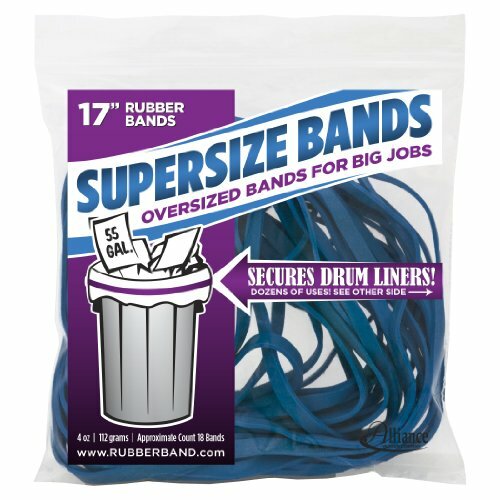 While a drum liner can easily slip out of place, causing a mess inside a garbage bin, these heavy duty rubber bands keep liners securely in place. There are plenty of great uses for these big rubber bands at home, whether it's for storing large items like carpets and mats or securing plastic tarps and coverings over large pieces of furniture. You might even discover a crafty use for these large elastic bands, like creating a colorful bulletin board for photos and notes or keeping glued parts together until set. Strong and flexible, these big rubber bands can be reused many times. They're an excellent replacement for packaging tape, twine and strapping, which reduces waste and the need for expensive equipment. SuperSize Bands are also made from latex, a rapidly renewable resource. Alliance Rubber File Bands colored elastics are an organizational tool with a wide variety of uses. They are a durable, reusable and color-coded way to organize your business, home office, kitchen, school or craft room. These Bands are easy to stretch and secure, helping to reduce symptoms related to carpal tunnel syndrome from repetitive strain. Looking for more Alliance Rubber Rubber Rubber Band similar ideas? Try to explore these searches: War Miniatures, Satin Touch Spray, and Parachute Cord Survival Bracelet. Look at latest related video about Alliance Rubber Rubber Rubber Band. Shopwizion.com is the smartest way for online shopping: compare prices of leading online shops for best deals around the web. 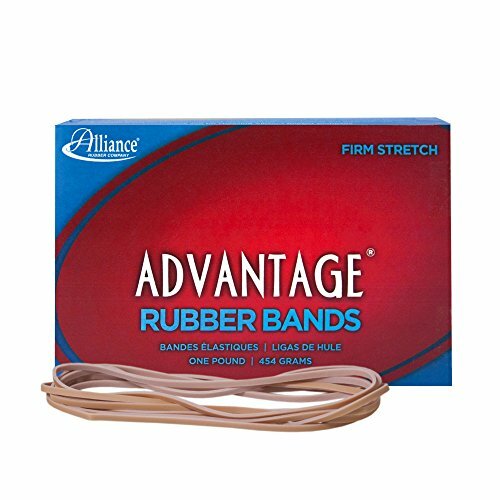 Don't miss TOP Alliance Rubber Rubber Rubber Band deals, updated daily.